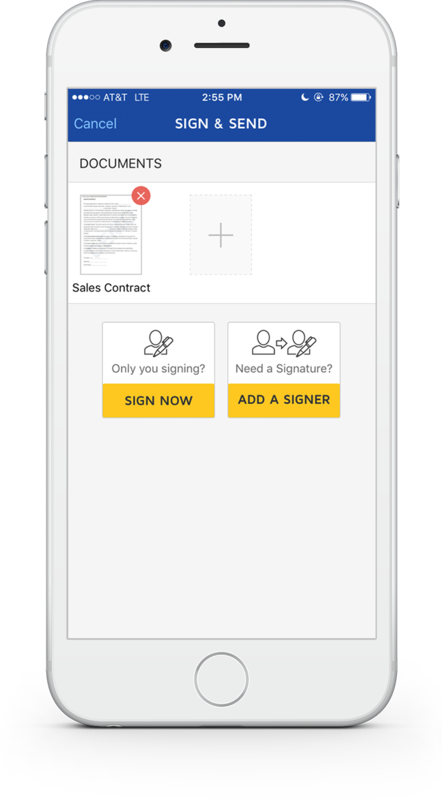 Sign documents or request signatures almost anytime, nearly anywhere. You don’t need to print or scan — just use the device at your fingertips. 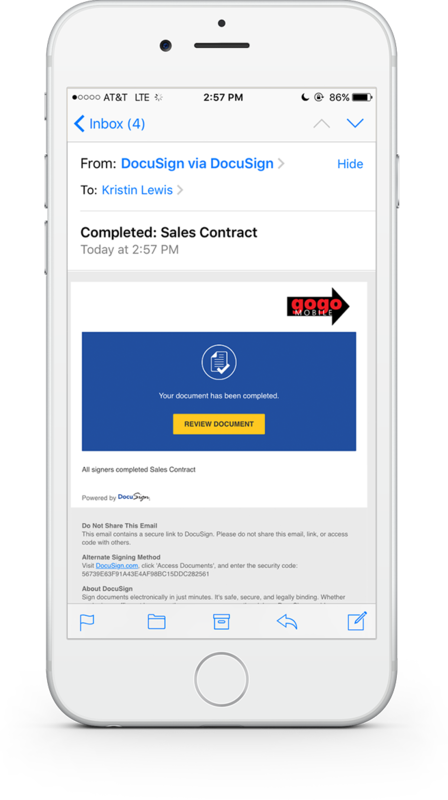 DocuSign makes it easy. Log in to your account and click [New] and then [Sign a Document]. Click [Upload] to select your file and upload it. Then click [Sign]. Quick Tip: You can also upload from popular cloud services. Drag the [Signature] tag from Fields to your document. Then click [Finish]. Pro Tip: Use other tags to add additional information to your document like date signed, name, and more. 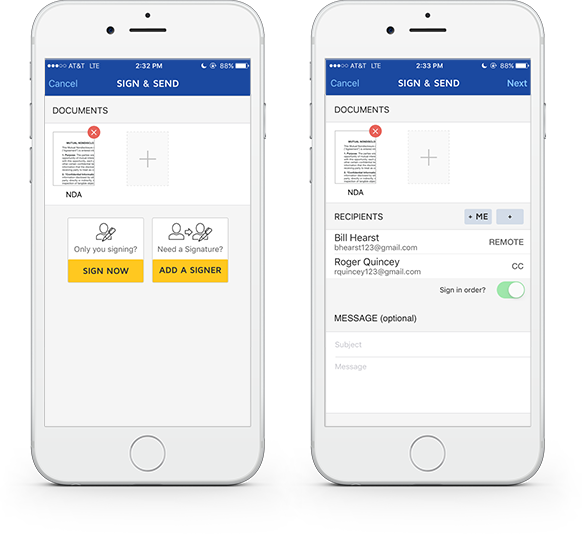 You can now send your signed document to anyone you would like by adding recipient information and clicking [Send and Close]. Otherwise, click [No Thanks] to finish. Congrats, you've just signed a document. 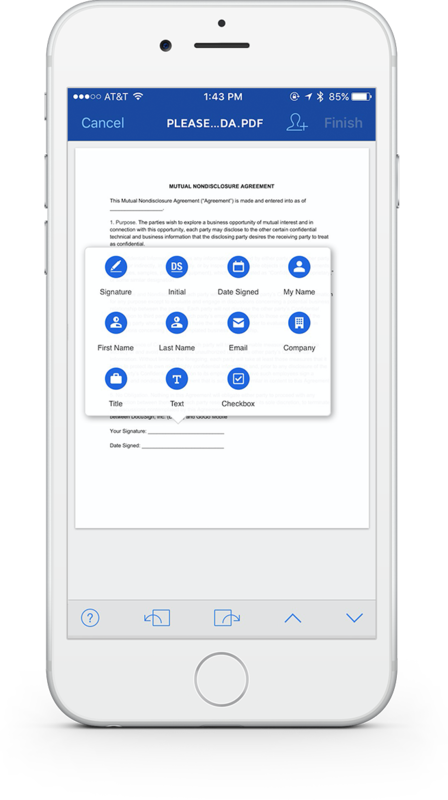 Check out how to sign a document from the mobile app or how to send a document. Or you can login to your account. Did you know? 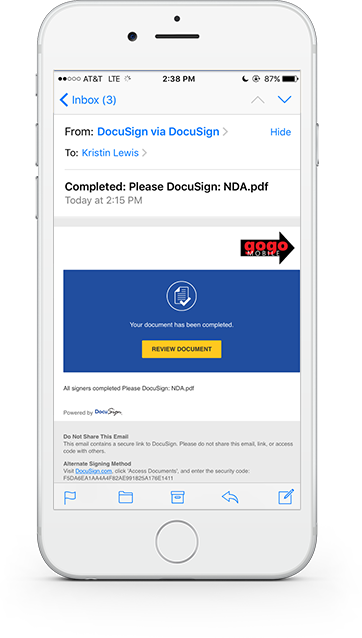 Any documents signed with DocuSign can be stored and accessed with a free DocuSign account. Great! Learn how to send a document. Maybe our support center can help. Open the app and tap [Sign & Send]. Upload the document you need to sign. Tap "Add" once you've selected it. Did you know? You can also add other recipients to receive a copy of the signed document once it has completed. Tap the area that needs the signature, select "Signature" from the menu and hit [Finish] when you're done. Check out how to sign a document from the desktop or how to send a document. 1. Log in to your account and click [New] and then [Sign a Document]. 2. Click [Upload] to select your file and upload it. Then click [Sign]. 3. Drag the [Signature] tag from the Fields to your document. Then click [Finish]. 4. 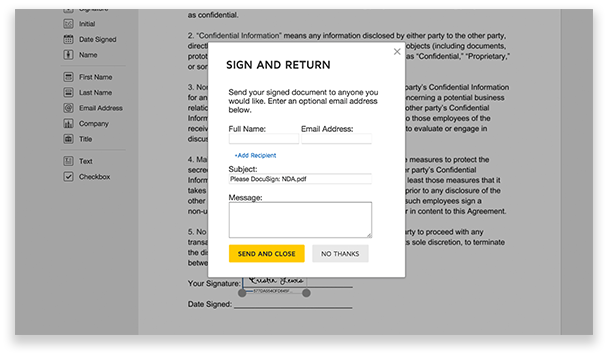 You can now send your signed document to anyone you would like by adding recipient information and clicking [Send and Close]. Otherwise, click [No Thanks] to finish. 5. Congrats, you've just signed a document. 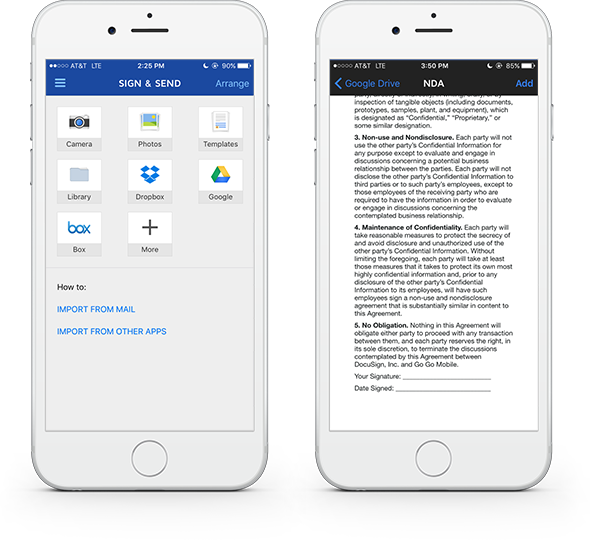 Check out how to sign a document from the mobile app or how to send send a document. 1. Open the app and tap [Sign & Send]. 2. Upload the document you need to sign. Tap "Add" once you've selected it. Did you know? You can also add other recipients to receive a copy of the signed document once it has been completed. 4. Tap the area that needs the signature, select "Signature" from the menu, and hit [Finish] once you're done. 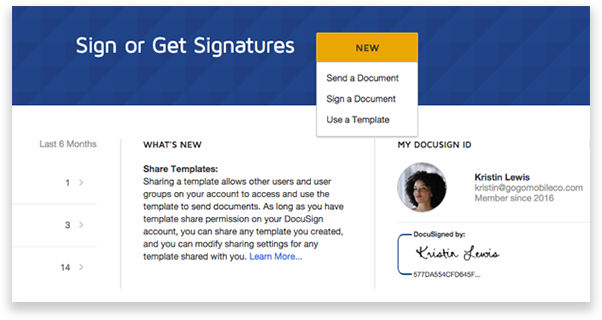 Check out how to sign a document from the desktop or how to send send a document. Log in to your account and click [New] and then [Send a Document]. Select your file and upload it. Drag the [Signature] tag from Fields to your document. Click [Send] once you've finished. Pro Tip: Clicking on a different recipient allows you to set specific tags for each signer. Use the various tags to make your documents even more advanced! Congrats, you've just sent a document. Your recipient will receive an email letting them know they have a document ready to be signed. 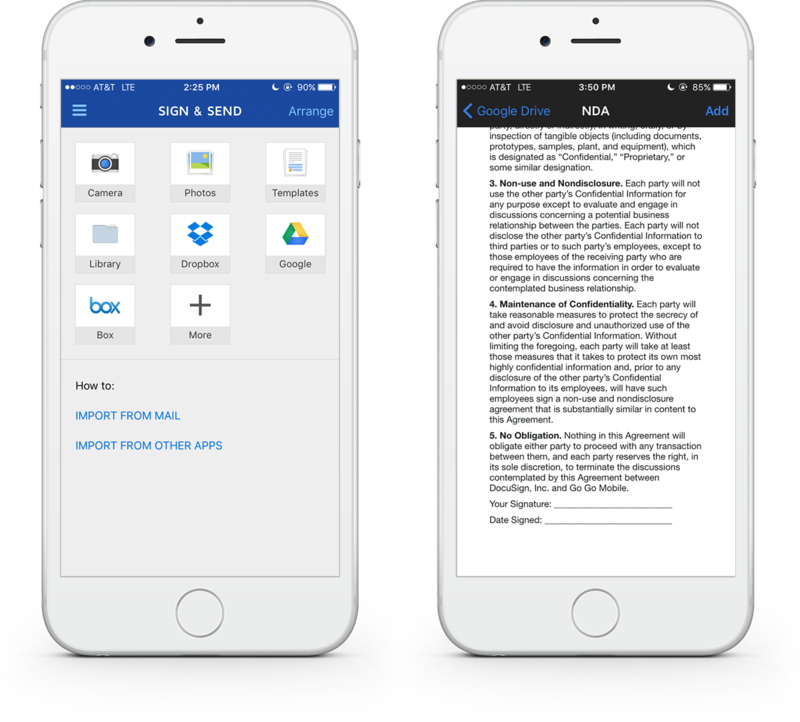 Check out how to send a document from the mobile app or how to sign a document. Great! Learn how to sign a document. Tap [Add a Signer], enter the recipient's information, and then hit [Next]. Tap the area that needs a signature and select "Signature" from the menu. Tap [Finish] once you're done. 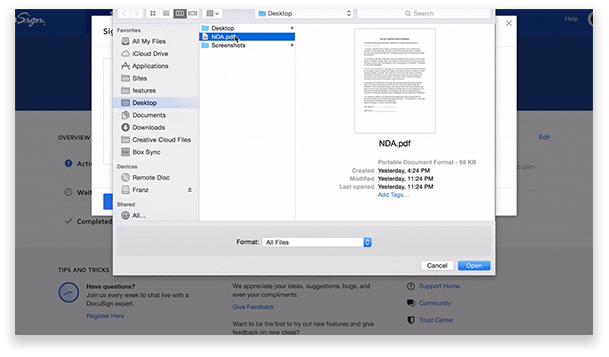 Check out how to send a document from the desktop or how to sign a document. 1. Log in to your account and click [New] and then [Send a Document]. 2. Select your file and upload it. 4. Drag the [Signature] tag from Fields to your document. You can also add things like [Date Signed] or [Initials]. Click [Send] once you've finished. 5. Congrats, you've just sent out your sales contract for signature. Your recipient will receive an email letting them know they have a document. 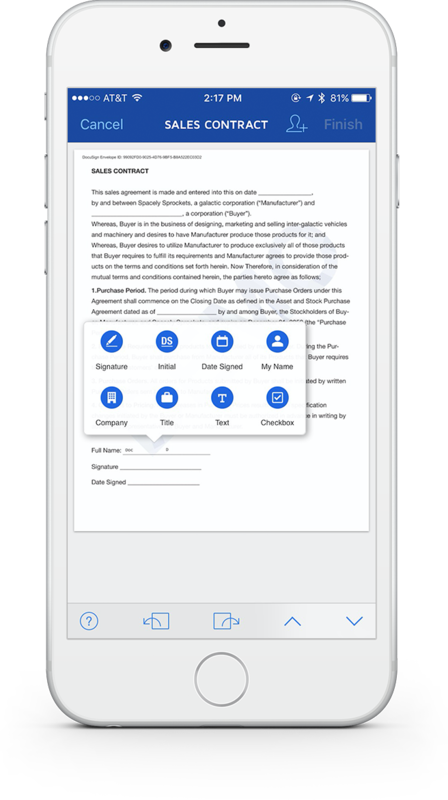 Check out how to sign a document from the mobile app or how to sign sign a document. 2. Upload the document you need to get signed. Tap "Add" once you've selected it. 3. Tap [Add a Signer], enter the recipient's information, and then hit [Next]. 4. Tap the area that needs the signature, select "Signature" from the menu. You can also add things like [Date Signed] or [Initials]. Tap [Send] once you've finished. 5. Congrats, you’ve just sent a document. Your recipient will receive an email letting them know they have a document ready to be signed. You’ll get a notification once it’s been completed. 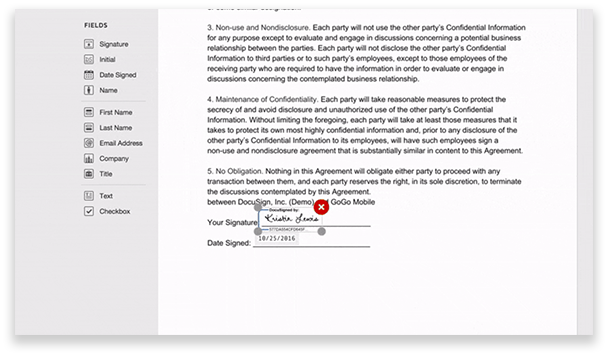 Check out how to sign a document from the desktop or how to sign sign a document. 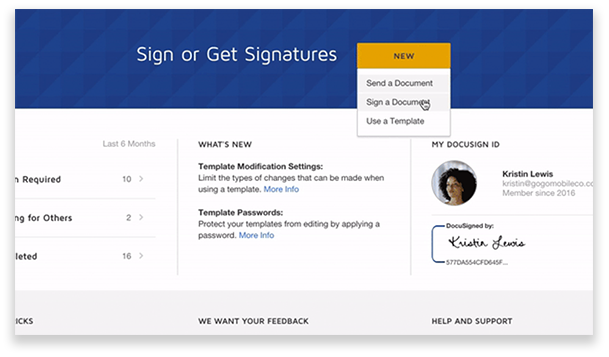 Access helpful tips and videos covering many of DocuSign’s most popular features. Or sign up for our DocuSign 101 webinar for live Q&A with a product expert. Can't attend live? You can view the on-demand version here. 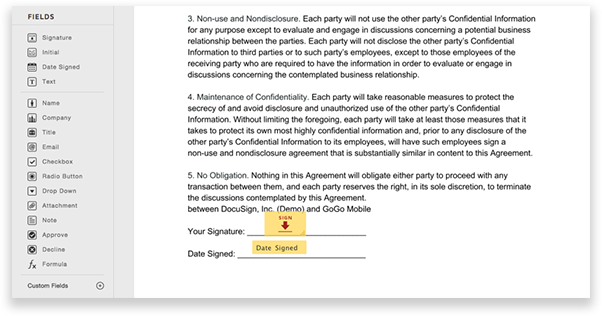 Is a document signed with DocuSign legal? Yes! 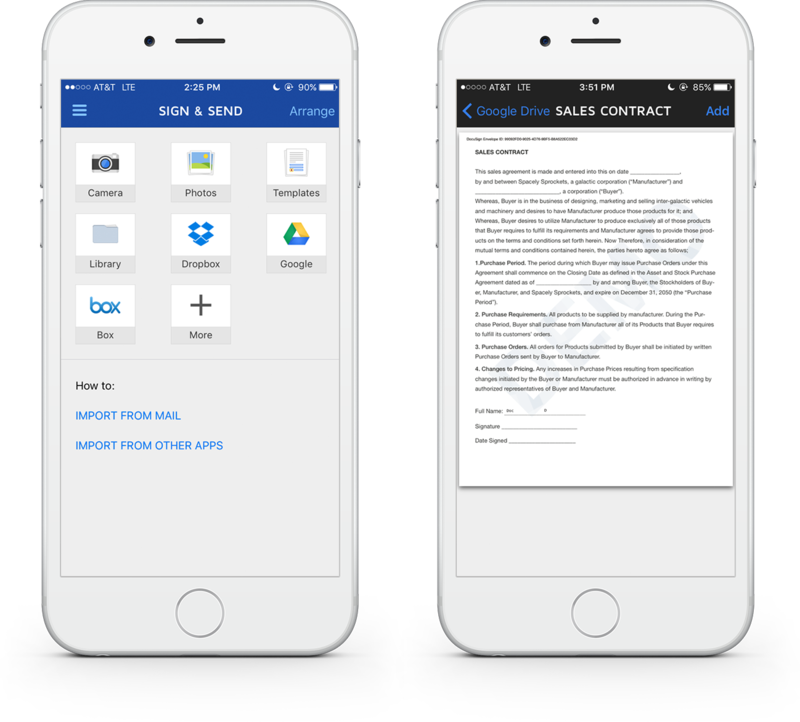 Documents signed using DocuSign are legally binding for nearly every business and personal transaction. 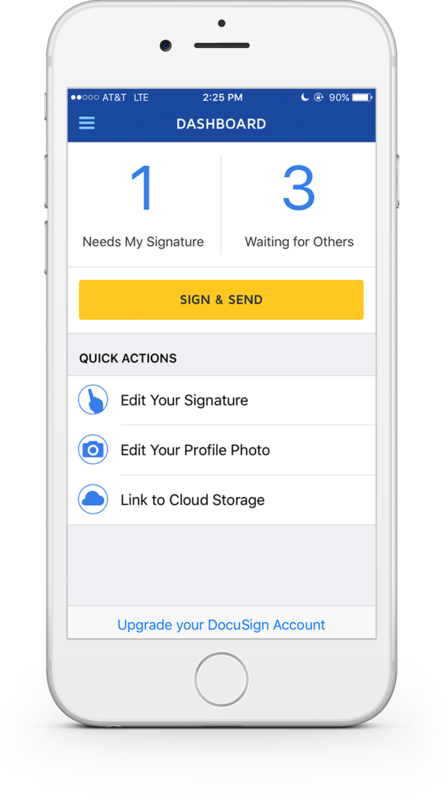 DocuSign offers eSignature methods that meet the legal standards set by governments around the world—as well as standards set for specific industries. 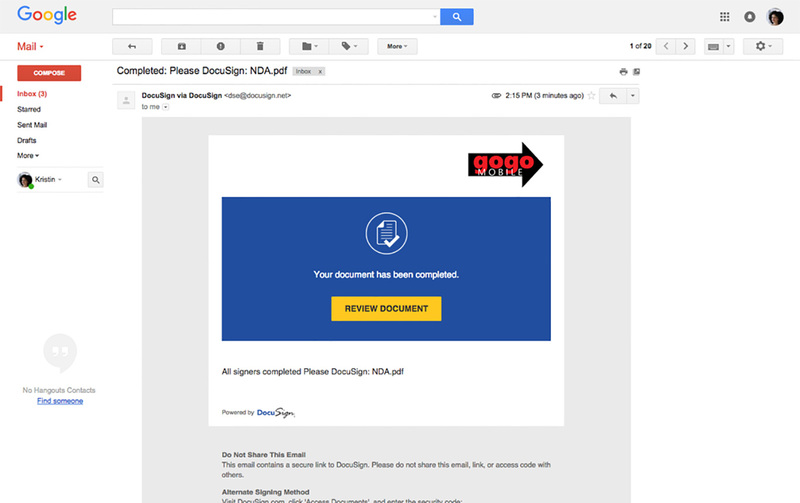 Can I (or the sender) get a copy of the NDA? Sure. 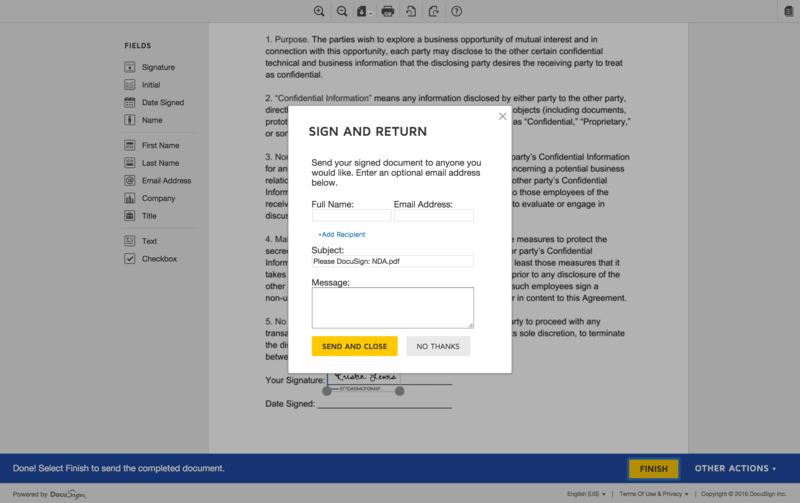 You simply log into your free DocuSign account and then click Documents. The NDA appears in the list. Save or print the signed copy from there. The other party can access it the same way. How can I send the NDA to another person for signing? Use the Send a Document option to set up the document, upload it, and then add yourself and the other party as a signer. 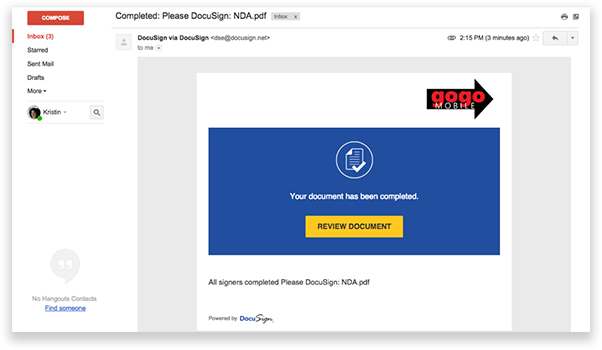 DocuSign automatically sends the document to the other person once you’ve signed it. Can I have people sign the contract in a specific order? Yes. You can set the signing order for the document on the Recipients page. Once a person signs, DocuSign automatically sends the document to the next person in line. Can I change the contract after sending it? As long as no one has signed yet, you can edit or replace the contract by uploading a new file. To protect the integrity of the contract, once it’s been signed by someone you can’t change it. Instead, void it and re-send the document. Can I set this contract up as a template? Sure. Templates are available with paid subscriptions. 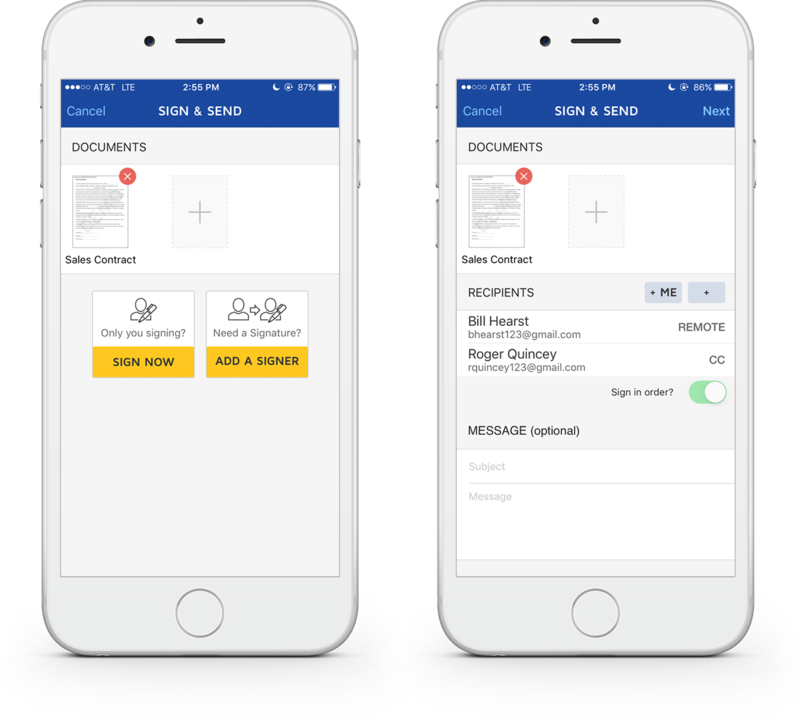 They make it even faster and easier to send the same type of document to new recipients—and you can even prepare and send them on the go from our mobile app.